The sentiment is from Friendly Phrases, a sweet little Verve set. I like the mix of point sizes within the same clean, crisp font. Thanks so much for popping over here today! Beautiful take on the sketch, Colleen. Love the flower. Awesome take on the sketch! Beautiful card Colleen! :) I love the colour! Oh, Colleen, love what you did with the sketch! You made it look so pretty and feminine with your colors, papers, and that sweet flower. So very fresh and charming! 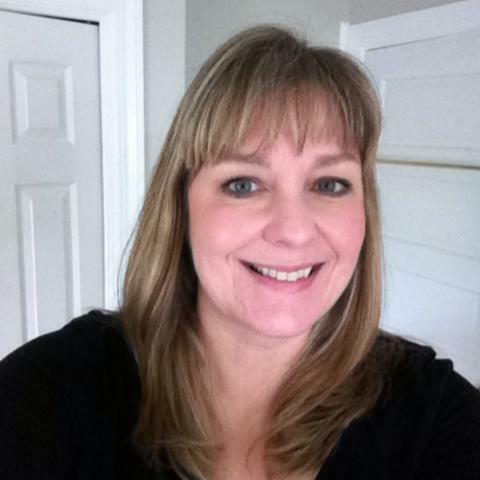 So fresh and pretty Colleen, love this! Whoot Whoot to your daughter!!! Those colors are outstanding! Beautiful card! Isn't it wonderful when our kids make us so proud? Good for your daughter! So beautiful! LOVING the colors and that flower!!!!!! What a beautiful card. And you should be so proud of your daughter. That's awesome. Love the colors, Colleen and the flower and the perfect pearls! FAB card! Blue and green look so pretty together. A big congrats to your daughter. Stunning! You nailed the sketch, your colors are so pretty! Just love the white flower! Love the coastal colors! My brain is on anything but winter at the moment! :-) great approach to the sketch! This is lovely, those colours are fabulous, and I love the patterns together. So pretty! 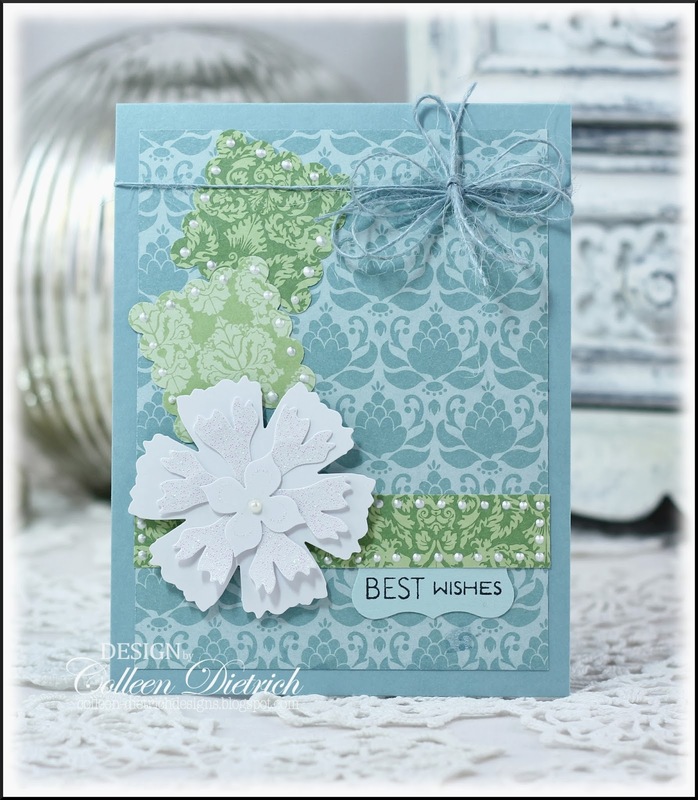 Love the greens and blues on this delicate card! Sweet flower, too! Have a great weekend, hugs! 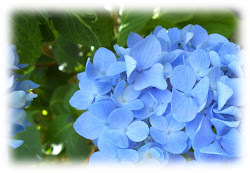 I love the contrast of that beautiful white flower against the soft blue and green! Love these colors! And proud Mama you should be! Congratulations to your daughter! Congratulations to your hard worker! You both must be so proud. 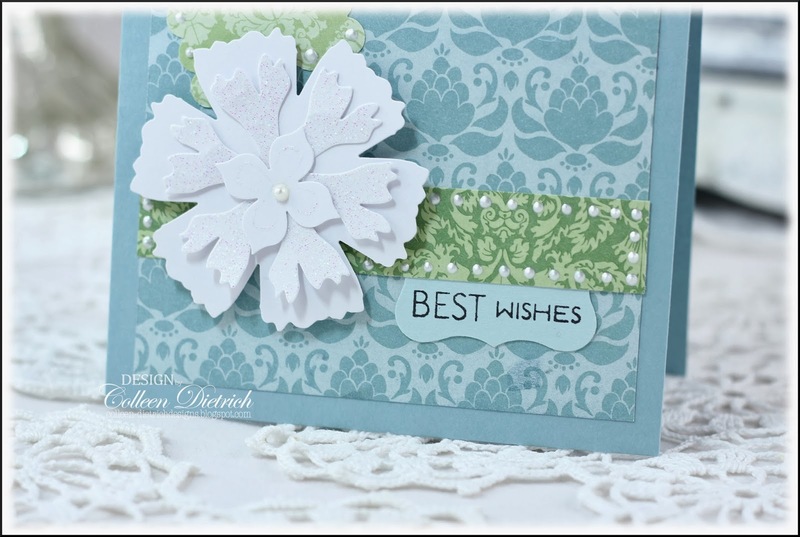 :-) I love the cool colors of this beautiful card. That big twine bow is awesome!